BEFORE I GO is a personal, affecting story about a young woman faced with her own mortality. On the eve of Daisy and Jack’s annual “Cancerversary” celebration – this year would’ve marked three years of Daisy being cancer-free – she receives the devastating news that her cancer is back – with a vengeance. It’s an aggressive stage-four diagnosis; Daisy has just months to live. The future she and her husband have been working towards – all the planning, and the fantasizing about life after university – is instantly crushed. Daisy Richmond is going to die at just 27-years-old. Colleen Oakley’s debut is emotionally honest, nuanced, and superbly written. While Daisy’s fate casts a dark shadow, the novel teems with wit and humour. It’s a fine balance, respecting the misery of her diagnosis while not allowing the narrative to get lost in the blackness. This is a novel that reminds us to make every minute count; to live in the moment rather than what might be, because we never know what’s right around the corner, and lost time is something that can never be replaced. Daisy’s perceptions are warped by her confrontation with death, and rather than enjoying the time she has left with her husband, she decides to find him a new wife; scouring coffee shops, the local park, and online dating sites, all in an effort to find Jack his perfect match. While her intentions might be noble, despite obviously flawed logic, Daisy’s mission forms a wedge in their marriage. A crisis should bring a couple together, not push them apart – and the crux of Oakley’s tale is whether Daisy will realize this in time; and if she does, will it be too late? 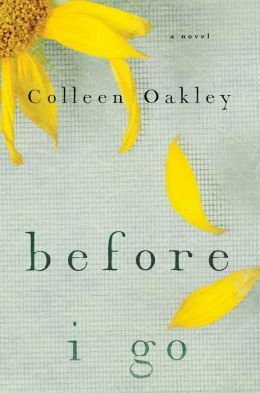 BEFORE I GO does not break new ground, and although the plot veers predictably towards its conclusion, Oakley’s debut is a potent exploration of a young woman’s final months and deserves a place alongside P.S. I Love You in your bookshelf. My thanks to the publisher for providing a copy of this title for review.